AdhereTech makes smart wireless pill bottles to track and improve medication adherence in real-time. Non-adherence and low engagement impact every party in healthcare, with the most affected group being patients who need the greatest amount of support. Each year in the United States, non-adherence contributes to $300B in increased costs, $100B in lost revenues, and worst of all - 125,000 premature deaths. The AdhereTech team was inspired to combat these issues by creating a simple and innovative solution: our patented smart pill bottle. AdhereTech makes smart wireless pill bottles that automatically track and improve adherence in real-time. Our solution is currently used by pharmaceutical companies and pharmacies to distribute medications to patients, and as well as large health systems to monitor and improve adherence for patients post-discharge. Here's how our solution works: As patients use AdhereTech bottles, adherence data is wirelessly sent from the bottles to our servers, where it is analyzed in real-time. The system automatically compares what patients are doing, to what they should be doing. 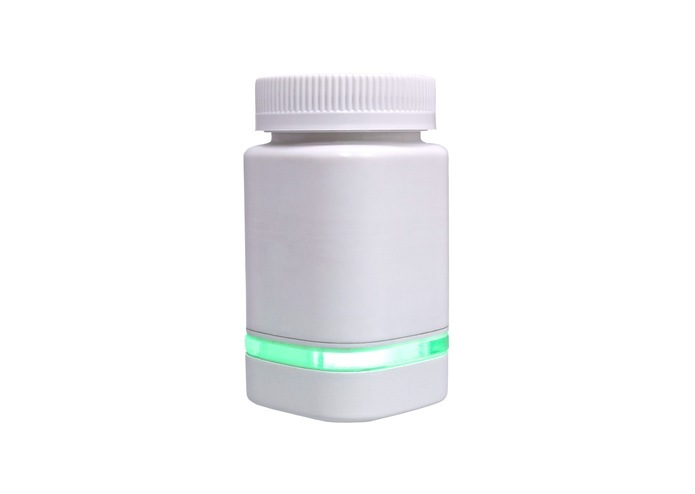 If a dose is missed, AdhereTech reminds the patient and/or caregiver via a series of customizable features, such as automated phone calls or text messages - as well as on-bottle lights and chimes. All messaging is customizable on both the population and individual-patient level, with English and Spanish options. But here’s what truly makes AdhereTech unique, compared to virtually every other tool in the digital health space: The flaw with all other monitoring solutions is that they require non-engaged patients, who already have issues managing their health, to set-up and learn complex tools. This is true whether a patient has to download and engage with an app every day, learn how to use a new device, charge a device every few days, or sync a device to Wi-Fi/Bluetooth. Non-engaged patients won’t perform these tasks. AdhereTech is the first monitoring tool that it built specifically with the non-engaged patient’s user-experience in mind. The bottles require zero setup or learning curve. The cellular technology allows our bottles to connect from anywhere on the planet and work right out of the box, with no setup. Additionally, our bottles are used just like normal pill bottles, down to the standard child-resistant cap, so there’s no processes to learn. All data is collected and analyzed passively, and the system only intervenes when it’s necessary. For the less tech-savvy, AdhereTech intervenes via automated phone calls to landlines, while more tech-savvy patients can receive text message interventions to cell phones or smartphones. If a patient does have a phone, he/she can still receive on-bottle reminders via lights and chimes. The battery in an AdhereTech bottle lasts 200+ days on a single charge, and the bottles are rechargeable as needed, just like a cell phone, using a standard micro-USB cord (AdhereTech provides these cords, which are also the most common charging cords on the market today). AdhereTech is ideal for non-engaged super-utilizers, because we fit into their lives, not the other way around.